Whereas, there is a need to promote alternative forms of transportation such as walking and bicycling in order to reduce pollution, reduce America’s dependency on fossil fuels, and improve the health and well-being of all people. 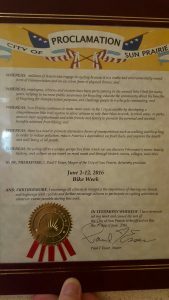 Whereas, bicycling offers a unique perspective from which we can discover Wisconsin’s scenic beauty, history, and culture as we travel on rural roads and through historic towns, villages, and cities. 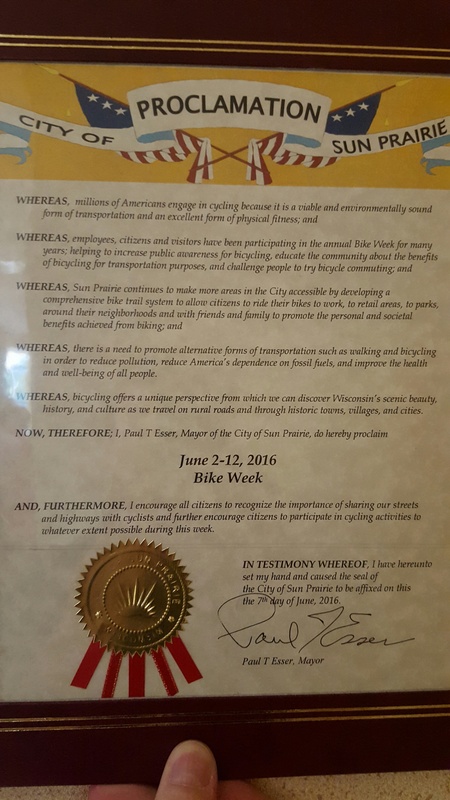 And, furthermore, I encourage all citizens to recognize the importance of sharing our streets and highways with cyclists and further encourage citizens to participate in cycling activities to whatever extent possible during this week. Don’t forget the ride on Thursday. See you at 6pm.